Neer Dosa / Mangalore Neer Dosa are thin lacy Rice pancakes or Dosas, quite popular in Karnataka. 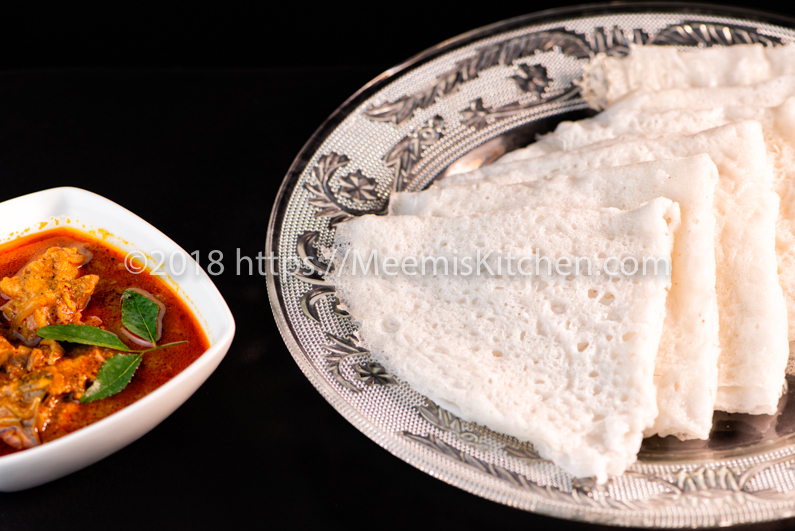 Like Kerala Palappam, Idli or Dosa, Neer dosa is served for breakfast along with any meat gravy or chutney. However, Neer Dosa does not require fermentation like Appam or Dosa. It can be prepared immediately after grinding. So, if you have unexpected guests, try this Neer Dosa next time. Also check these links for more breakfast recipes like Idiyappam, Aval appam without coconut, Matta Ari Puttu, Poori Bhaji, Aloo Paratha, Rava Poori, Beef Puttu etc. The first time I ever tasted Neer Dosa was when my cousin Linda brought some home. Her friend Sandhya, who is from Mangalore, is an expert cook and Linda used to rave about Sandhya’s Neer Dosa and other Mangalorean dishes. It was so delicate and spongy, but like always I was skeptical about trying it straight away. I thought about getting a new shallow pan, since this is very watery, and you need to spread the batter without spilling. So, I kept stalling it until recently, when I got this new pan and ran out of excuses! Preparing the batter was quite easy; I just had to soak the rice and grind along with some freshly grated coconut and add plenty of water. Really, “Neer” means Water and you need to add lot of water to get perfect “Water Dosa” batter like milk or butter milk consistency. The first time, the batter was thick, so, I kept on adding water till I got the desired soft, thin Neerdosa. With all the trials, the batter got over fast, so I had to soak rice again for dinner and this time, I was more confident and got it right straight away. Easy-peasy!! Authentic Mangalore Neer Dosa recipe does not add Aval/ cooked rice in the recipe; you may try that version as well. Mangaloreans have Neerdosa with Coconut chutneys, Tomato chutneys, Veg. curry or Kormas, but my Kerala taste buds wanted to try some other combinations. Paired with some Nadan chicken curry, it was utterly delicious. You can also try it with spicy Beef curry, Egg Roast, Peshawari Chicken curry, Mutton stew, Beef fry, Pepper chicken, Chettinad chicken curry, Punjabi Chicken curry, Pork Pepper fry etc. for variety. In fact, I think the delicate Neer Dosa, will blend with any Indian curry and is ideal for Breakfast and dinner. Hope you will try and enjoy this simple Mangalore Neer Dosa recipe! Happy cooking! Wash and soak raw rice for 4 hours or more. 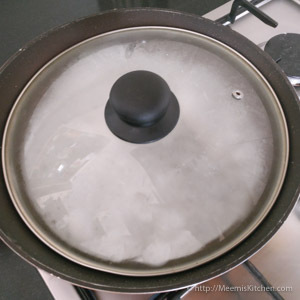 Soak Aval/ rice flakes in lukewarm water for 5 minutes. Grind rice, Aval or cooked rice, scraped Coconut, sugar and enough water till you get fine batter. Add salt and more water, mix well till you get thin batter, milk like consistency. Heat a shallow bottomed pan and pour one ladle full of batter. Swirl/rotate the pan to get the circular shape of NeerDosa. Cook covered for one minute on slow fire to get lacy Neerdosa. Fold into half and fold again to get a triangular shape. Do not stack immediately as the dosas might stick to one another. Stack only after it is moderately cooled. Enjoy with chutneys or curry of your choice. Authentic traditional recipe does not have cooked rice/ Aval. Coconut should be slightly tender for best results. Dry coconut will make the batter grainy. Sugar is optional. I added just half teaspoon to improve the taste. You can start preparing Neer Dosa immediately after grinding. Fermentation is not required. If there is excess batter, you can keep it in the refrigerator and use later. Add little water if required, before preparing. 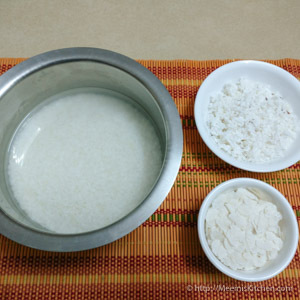 Sona Masoori rice or medium thin grained rice is best for preparing Neer Dosa. 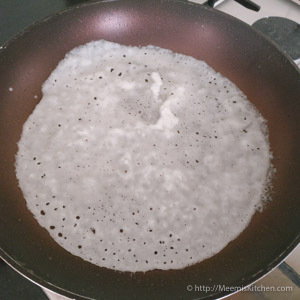 Shallow bottomed pan would be best for preparing Neer Dosa, as you need to swirl the batter in the pan to make thin dosa. 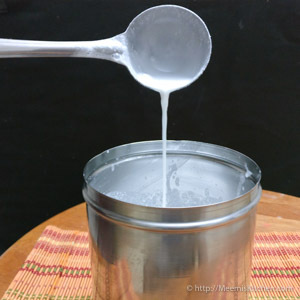 Use water as required to get the correct milk like consistency. Hope you like this simple Mangalorean recipe for Neer dosa. Please do put in your comments or share with your friends with the help of buttons on the side. It would definitely encourage me! God Bless!